A pvserver in Lua can be created without installing the Qt SDK and a C++ compiler. All you need is within our installation package. The structure of a Lua pvserver is very similar to the C/C++ version, Our libraries are used via a language binding that is created with swig. Because of this the reference manual for the pvslib and the rllib can also be used for Lua. 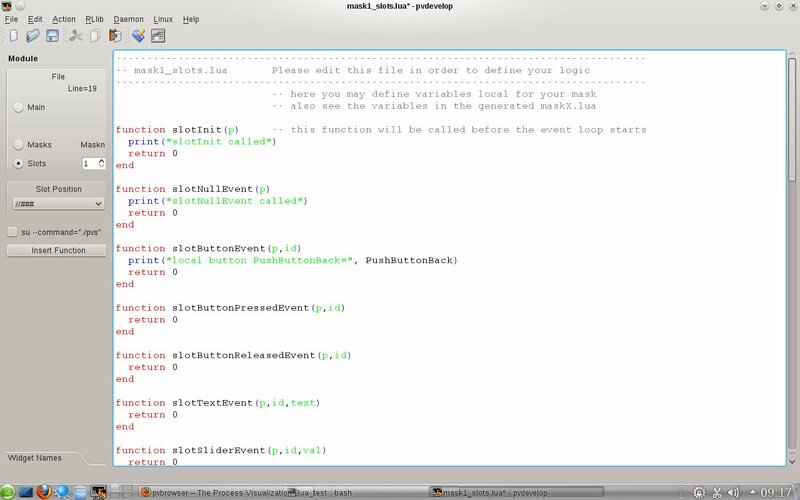 There is a main program called pvslua which will read file main.lua and execute the lua script. 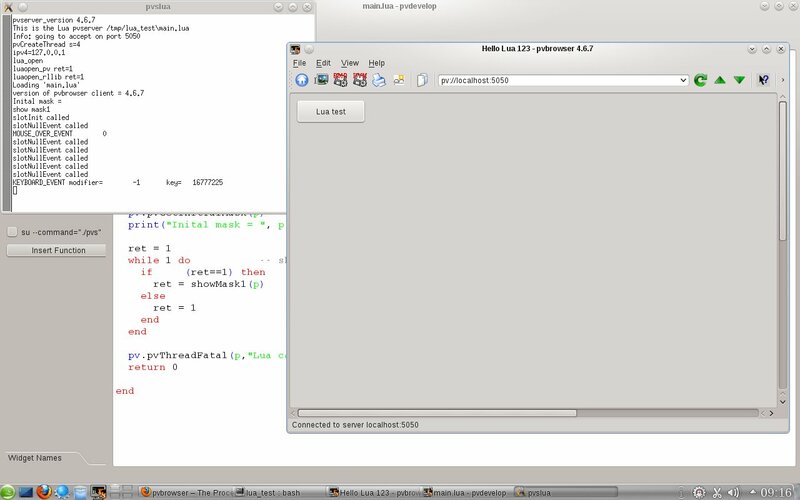 Within main.lua there is a function luaMain(ptr) where the handling of a pvbrowser client starts. In fact pvslua is a C/C++ program with the same structure as a pvserver in C/C++. But within pvMain() pvslua starts processing main.lua. With a pvserver in Lua it is possible to change the Lua code while the pvserver is running. A newly connected pvbrowser client will immediately see the modified version. Whenever a pvbrowser client connects pvslua creates a new thread for handling that client and executes file main.lua. The function showMask1() will show and handle mask1. 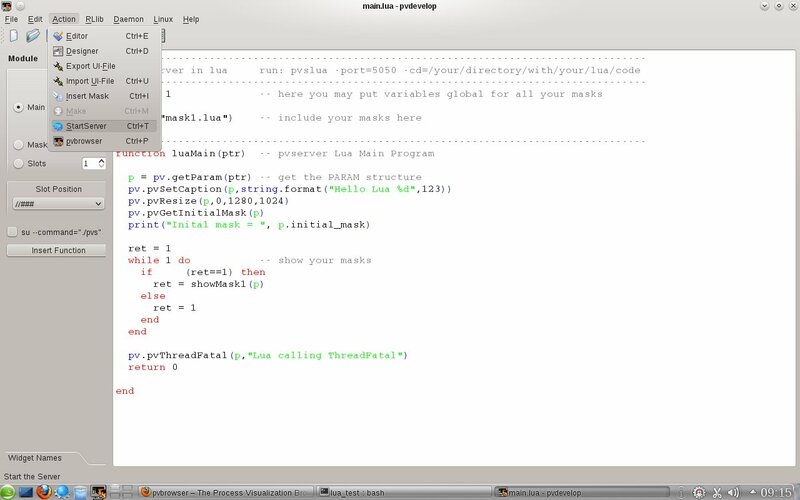 showMask1() is generated by pvdevelop. You do not have to write it manually. It will show mask1. On the begin of that function the names of the widgets you have designed are listed. Also the toolTip and whatsThis properties of the widgets are listed and the widgetType is available. 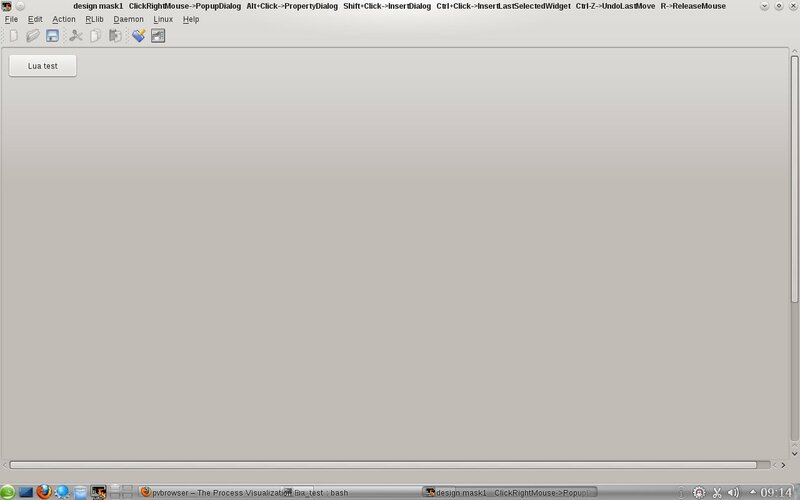 Then you see the calls to pv functions that create the widget tree in the pvbrowser client. Finally the function goes to the event loop where the events send by the pvbrowser client are interpreted and the according slotFunctions are called. -- this file is generated by pvdevelop. DO NOT EDIT !!! The task of the developer of a visualization is to code the slotFunctions. 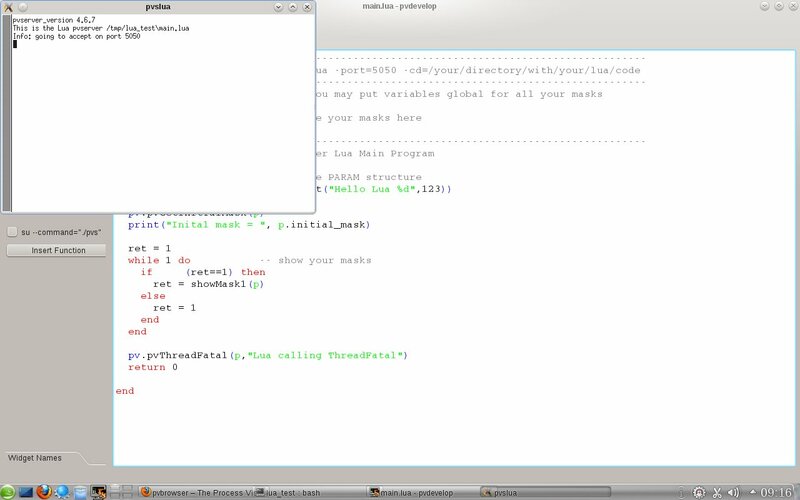 The framework was generated by pvdevelop when you created the mask.